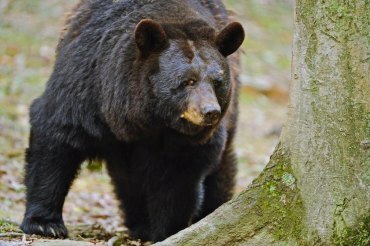 SOUTH CHARLESTON, W.Va. – Deer hunters are reminded that a concurrent bear season without dogs will occur from Nov. 21 through Dec. 3, 2016, in 33 West Virginia counties. Seventeen counties in the eastern mountains will be open to concurrent deer and bear hunting on private and public land. Hunters in those counties are required to have applied for and received a limited bear firearms season permit to participate, or be a resident landowner hunting on their own property. The counties open to limited bear hunting on private and public land during the buck-gun season include Barbour, Braxton, Calhoun, Clay, Gilmer, Grant, Greenbrier, Hardy, Harrison, Lincoln, Pendleton, Pocahontas, Randolph, Tucker, Upshur, Webster and Wirt. Hunters do not need a limited bear firearms season permit to participate in the following 16 counties: Berkeley, Boone, Fayette, Hampshire, Jefferson, Kanawha, Lewis, Mercer, Monongalia, Monroe, Morgan, Nicholas, Preston, Raleigh, Summers and Taylor. Mast conditions in 2016 vary widely based on location, according to DNR’s Mast Survey and Hunting Outlook. In many areas of the state, abundant red oak group mast will have bears dispersed across the landscape. However, in areas where acorns are scarce, bears will be concentrated where soft mast species like black cherry and autumn olive are abundant. “These special seasons offer a unique opportunity for hunters who may have never bear hunted before to harvest a bear, and we hope that they take advantage of this season structure,” said Carpenter. Bear hunting opportunities continue after the buck gun season. All or parts of 24 counties will be open for bear hunting with or without hounds Dec. 5-31, 2016. In addition, all or parts of 37 counties will be open for bear hunting without hounds Dec. 5-31, 2016. Successful hunters are required to submit a first premolar tooth from each harvested bear. Information on how to collect and submit a black bear first premolar tooth can be found on page 37 of the 2016- 2017 Hunting and Trapping Regulations Summary. Hunters who harvest a female black bear are encouraged to save the reproductive tract or all the entrails. Hunters with reproductive tracts or entrails should keep them cool or freeze them and contact their nearest DNR district wildlife office or the Elkins Operations Center to arrange drop-off. Hunters can get a bear tooth envelope and information on what a complete reproductive tract consists of at all DNR district offices or the Elkins Operations Center. Data obtained from tooth samples and reproductive tracts are used for black bear population monitoring. Hunters are reminded to purchase a bear damage stamp as well as an appropriate hunting license. Details concerning bear hunting seasons can be found on pages 35-39 of the 2016-2017 Hunting and Trapping Regulations Summary.